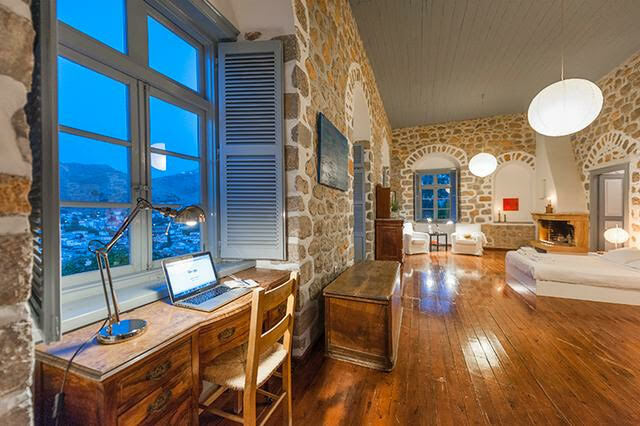 The Stone House is a lovingly-restored 18th-century aristocratic mansion set atop a hillside immediately overlooking the quaint Hydra harbor. 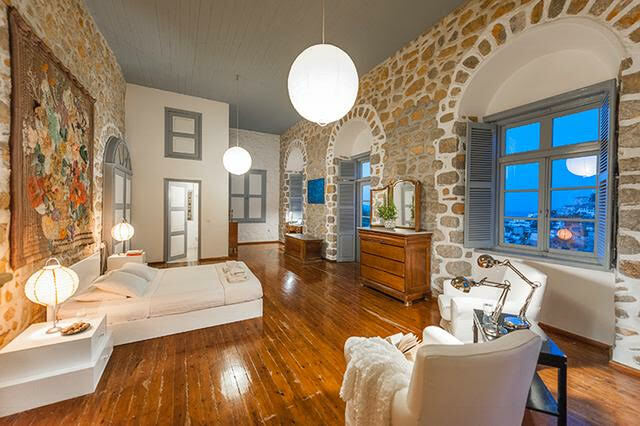 It has fabulous views to the sea, village and mountains. A hand-hewn stone wall encloses the main house, a guest cottage, and a series of gardens and terraces. 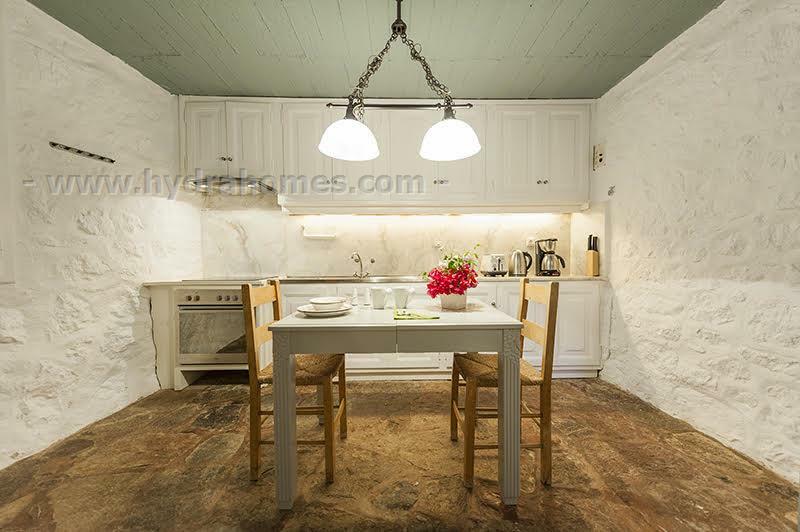 With three bedrooms and two and a half baths, the property comfortably sleeps seven. The main house contains a living room, dining room, kitchen, master bedroom and bathroom, and guest bedroom and bathroom. It is equipped with all the implements for entertaining - and both the indoor and outdoor dining tables seat 8-10. The grand master bedroom and its private balcony boast exquisite views in all directions. The guest cottage has a charming brass bed and beautiful corner fireplace. 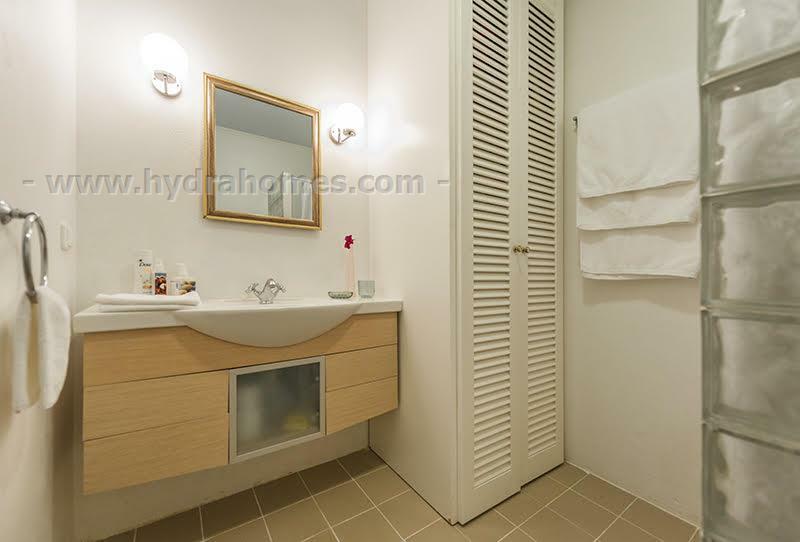 A half-bath lies just steps away. On its roof, a wonderful terrace is outfitted with a marble dining table, and has excellent views as well. There’s also an outdoor shower under a scarlet bougainvillea. The compound is very central: a short walk down one set of the island's many cobblestone staircases places you in the heart of the port. A path through a pine grove brings you to swimming coves. 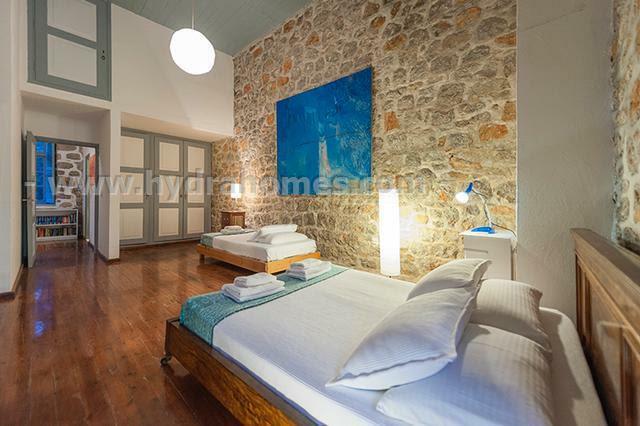 Stone House is certified by the Greek National Tourism Organization and can legally be used as a holiday let property. The furniture can be negotiated separately. The house is 259 m2 on a plot of 569 m2. 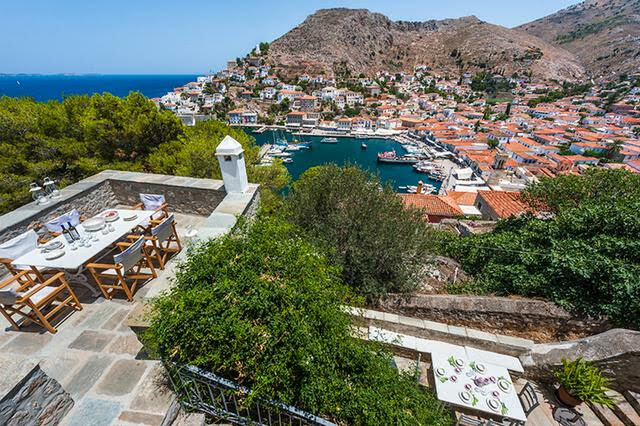 The Stone House is a lovingly-restored 18th-century aristocratic mansion set atop a hillside immediately overlooking the quaint Hydra harbor. 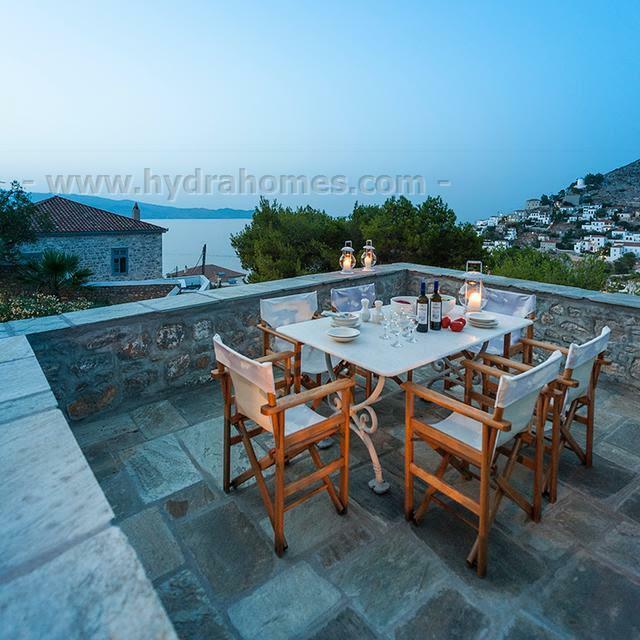 It has fabulous views to the sea, village and mountains. 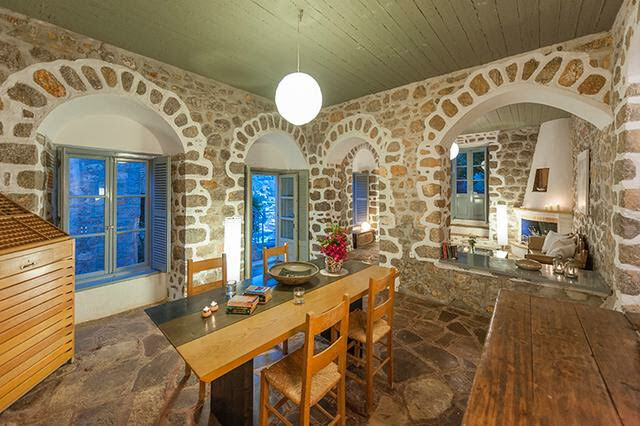 A hand-hewn stone wall encloses the main house, a guest cottage, and a series of gardens and terraces. 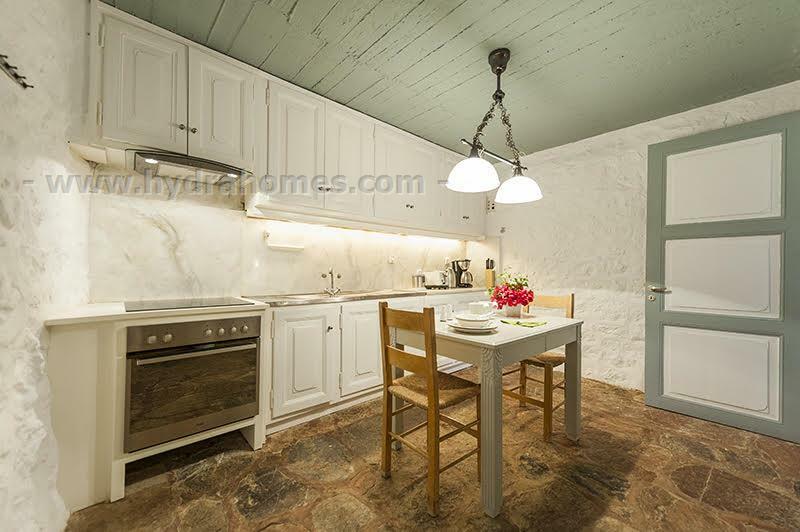 With three bedrooms and two and a half baths, the property comfortably sleeps seven. The main house contains a living room, dining room, kitchen, master bedroom and bathroom, and guest bedroom and bathroom. It is equipped with all the implements for entertaining - and both the indoor and outdoor dining tables seat 8-10. The grand master bedroom and its private balcony boast exquisite views in all directions. The guest cottage has a charming brass bed and beautiful corner fireplace. A half-bath lies just steps away. On its roof, a wonderful terrace is outfitted with a marble dining table, and has excellent views as well. There’s also an outdoor shower under a scarlet bougainvillea. The compound is very central: a short walk down one set of the island's many cobblestone staircases places you in the heart of the port. A path through a pine grove brings you to swimming coves. 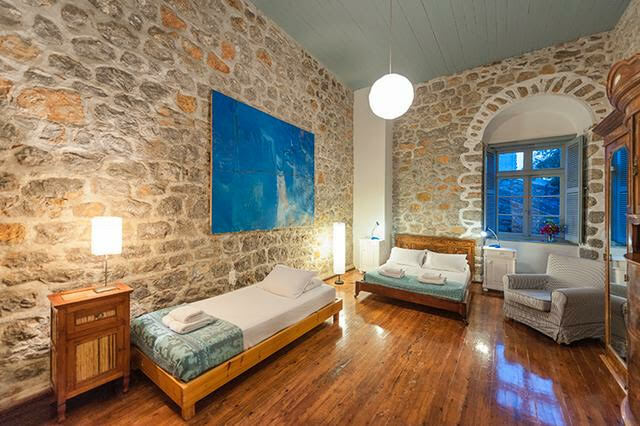 Stone House is certified by the Greek National Tourism Organization and can legally be used as a holiday let property. The furniture can be negotiated separately. The house is 259 m2 on a plot of 569 m2.